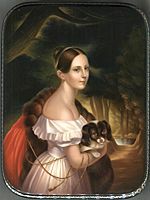 This gorgeous portrait of a young lady with a dog in her hands has been painted by Sergey Fomichyov. The artist has splendidly painted the festive costume of the lady. The face of the depicted woman is also nicely painted. The crimson brown background tones beautifully with her brown eyes and her costume painted in various shades of brown oils. The portrait is framed with a wavy gold pattern. More complex and rich gold filigree pattern wraps around the box's sides. The box's exterior is painted in imitation of a stone (golden veins are scattered against the light gray background). Red lacquer completes the interior of the work. The box is constructed from paper-mache in the famous Workshops of sergey Tyurin. The lid is hinged from the left of the portrait, and the box rests on a flat bottom. The work is signed with the artist's name and the year of 2007.